The most obvious development is the wallpapers that take advantage of the punch-hole cam to add a little bit of extra flair to your home screen or hide the camera within design elements like the eye of a penguin. 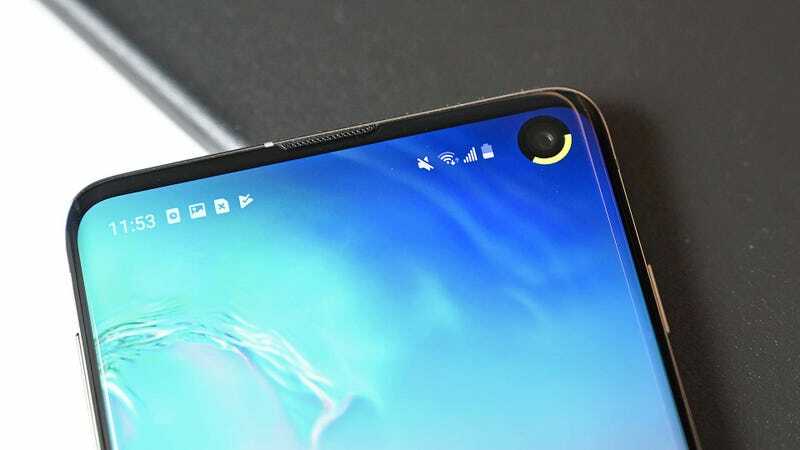 But IJP’s new Energy Ring app takes that idea even farther by adding some extra utility that lets you see the S10's battery level just by looking at its front cam. Energy Ring, which is available for free on the Google Play store, is an evolution of IJP’s previous battery indicator apps and gives you the ability to put a small, colored ring around the outside of the front cam. By default, Energy Ring is set to go from green to red as your phone runs out of juice, but really it could look however you want. Energy Ring even allows you to customize the gradient and thickness of the ring, which direction you want to the ring to move, and the option of hiding the ring when you are viewing full-screen content. And when you recharge the phone, you can even set the app to animate the ring using a number of different presets (linear, acceleration, bounce, etc.). While Energy Ring isn’t a revolutionary idea, it is a neat way to get spruce up your phone. And since you can’t really get rid of S10's punch-hole camera, you might as well have some fun with it. Heck, who knows, you might even end up relying on Energy Ring instead of the boring old (and less customizable) battery icon.